Biomass harvesting and collection is an important step involving gathering and removal of the biomass from field which is dependent on the state of biomass, i.e. grass, woody, or crop residue. The moisture content and the end use of biomass also affect the way biomass is collected. For crop residues, the operations should be organized in sync with the grain harvest as it occupies the centrestage in farming process. All of other operations such as residue management and collection take place after so-called grain is in the bin. On the other hand, the harvest and collection dedicated crops (grass and woody) can be staged for recovery of the biomass only. In agricultural processing, straw is the stems and leaves of small cereals while chaff is husks and glumes of seed removed during threshing. 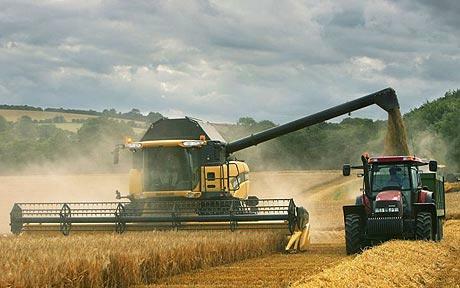 Modern combine-harvesters generally deliver straw and chaff together; other threshing equipment separates them. 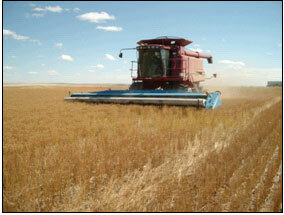 Stover is the field residues of large cereals, such as maize and sorghum. Stubble is the stumps of the reaped crop, left in the field after harvest. Agro-industrial wastes are by-products of the primary processing of crops, including bran, milling offal, press-cakes and molasses. Bran from on-farm husking of cereals and pulses are fed to livestock or foraged directly by backyard fowls. The proportion of straw, or stover, to grain varies from crop to crop and according to yield level (very low grain yields have a higher proportion of straw) but is usually slightly over half the harvestable biomass. The height of cutting will also affect how much stubble is left in the field: many combine-harvested crops are cut high; crops on small-scale farms where straw is scarce may be cut at ground level by sickle or uprooted by hand. Collection involves operations pertaining to gathering, packaging, and transporting biomass to a nearby site for temporary storage. The amount of a biomass resource that can be collected at a given time depends on a variety of factors. In case of agricultural residues, these considerations include the type and sequence of collection operations, the efficiency of collection equipment, tillage and crop management practices, and environmental restrictions, such as the need to control erosion, maintain soil productivity, and maintain soil carbon levels.